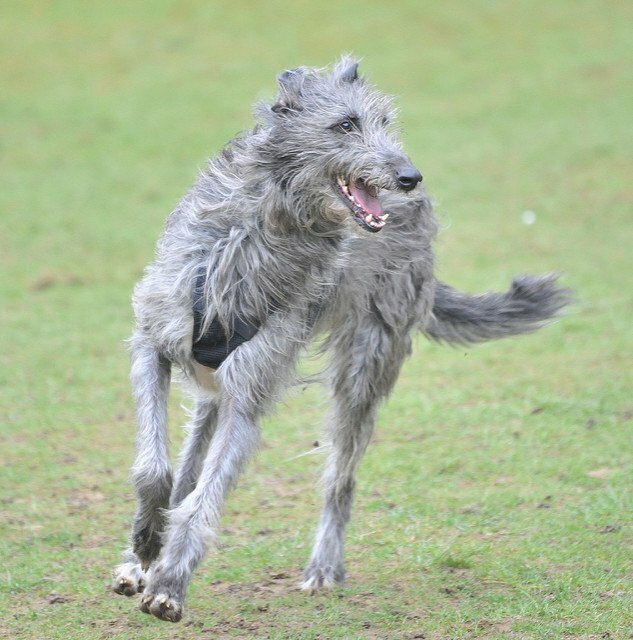 The Scottish Deerhound dog breed looks like a large, big-boned Greyhound with a rough coat. These dogs are slim and tall, with a 3- to 4-inch-long coat, mustache, beard, and mane. 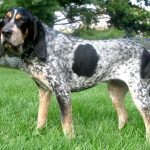 Their coat is wiry and gray – either blue-grey, brindle, or fawn – although there may be some white on the tail, feet, and chest. 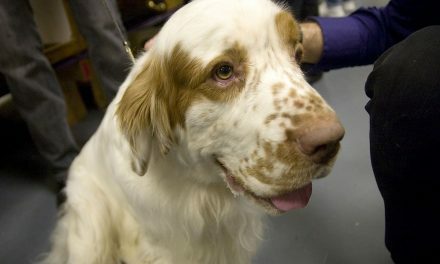 Dogs carry their heads high and have hazel or chestnut eyes, a dark nose, and soft ears. The long curved or straight tail almost reaches the ground. Photo taken by by Adam Singer from Flickr is licensed under CC BY-SA 2.0. Scottish Deerhounds are gentlemanly, elegant, polite, and gentle. They are loving and friendly with children and loyal and devoted to their families. Although they are often called courageous in the field, they love people (even strangers) too much to be used as guard or watch dogs. 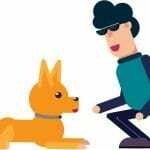 Owners should be confident, consistent, and firm to prevent dogs from becoming willful. 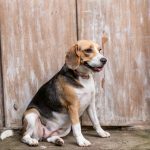 This breed does well with other dogs – they love to play – but they should not be left alone with other pets. Adult dogs tend to be 28-32 inches tall and weigh around 75-110 pounds. The Scottish Deerhound dog breed does not do well in an apartment setting. Although they are mostly inactive indoors, they need at least a large yard, if not more room, to run around. 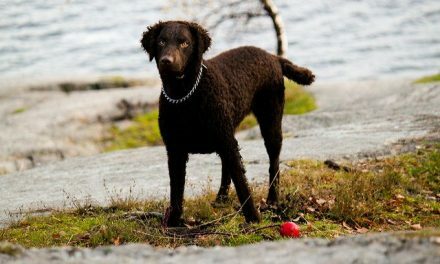 This breed needs a lot of exercise, but should only be taken off-leash in a secured area. These dogs like to chase things, and they are incredibly fast. To stay healthy, dogs need a daily long walk or run. Well-cared for dogs can be expected to live less than 10 years. The harsh coat requires extensive grooming, including stripping and trimming. The Scottish Deerhound dog breed is an old breed, bred to hunt deer in the Middle Ages by Scottish Chieftains. 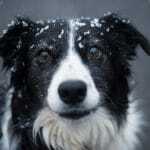 The protective, rough coat makes them well-suited to the harsh climates found in Scotland. 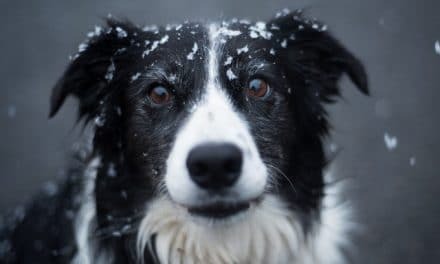 The breed was very popular with Scottish nobility and became the Royal Dog in Scotland – for a time it was illegal for anyone lower than an Earl to even own one of these gentle dogs. When the Scottish clan system fell, the breed went into decline and nearly became extinct. 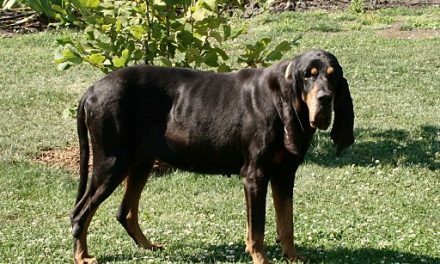 The breed was revived in the 1800s by two brothers. The dogs again became favorites in the British Isles until WWII, when many owners could not feed the large dogs. A few were saved and used to repopulate the breed after the war. The Scottish Deerhound is used mostly as a companion dog. They are classified as sighthounds, but they also have an excellent sense of smell and are good at tracking, agility, hunting, and racing.